It was snowing and windy today. Yesterday, it was so warm that we skied without gloves and hats. These are the big events in our lives as we bide our time and try to stay limber while we wait for the Basler to make it's way from Resolute Canada to Lonbyearbyen. Writing these simple facts is nearly as mundane as it was to experience them. But this is the game and it is one that I have played before. And I'm not going to lie, I'm pretty good at it. There is a certain mindset you need to endure the limbo that were trapped in. Focusing on the minutia, trying to solve problems, analyzing the 'why's' and 'what if's'... this is not useful. To survive you have to let go. There is literally nothing we can do at this point. Therefore, accepting that the plane will be here when it gets here is the only path forward. Of course, it is insanely challenging as well. It's 2019 after all (where did all the time go) and waiting is not really a word in our vocabulary anymore. We live in a world with schedules and commitments. Seconds are just as important as minutes and hours. I jokingly suggested to our team that we would form activity committees much like historic expeditions did. These were people trapped by ice in small ships for YEARS and they worked in groups to create newspapers, stage plays, hold educational classes, perform music and more. The big stress of my expeditions used to come from enduring the physical danger and mental strain of traveling in such remote and extreme environments. As I've gained more experience, those things don't affect me as nearly much as they used to. I remember my first North Pole expedition in 2005 (attempt). I literally thought I was going to die on the ice and I would start weeping (yes, weeping) randomly as I was skiing because I was so scared. I have mastered places like this and the stark fear that I felt with each step is nearly gone. Instead, it is replaced by the equally intense pain of being away from my family that stretches my limits to a wire thin edge. (I know I write about missing my family a lot - but it's on my mind a lot - so please bear with me). Being here this year, I will miss my kids' dance recitals, art shows, science projects, ski and swim lessons, spring break, a camping trip in Fruita, another trip to a water park and my daughter's fourth birthday... which will make this fourth time I've missed her birthday. Ankur forwarded a poem to our team that his wife had sent him. It's called 'My Soul Has a Hat' by Mario de Andrade. I was touched that he shared it with us and even more surprised at how much I related to the message (which is I guess why he sent it in the first place, come to think of it). 'I counted my years and realized that I have less time to live by, than I have lived so far.' de Andrade writes in the first line. Which, for better or worse, is something that I've been thinking a lot about lately. Now, it's probably not my place to pick and choose which parts of a poem should be shared or not, but I am believer in small things having big impacts and sometimes a piece can be just as important as a whole. Still, I like when words tumble together and find away to touch your heart (in whatever way) and these did just that. This is not the point where my old high school friend of over 30 years would say, 'I don't want to know what you're feeling. I just want to know where you set up camp and what you ate for dinner.' Well Rick, I had spaghetti for dinner, not a freeze-dried meal (unfortunately). The wind switched 180 degrees from yesterday and some of the landfast ice at the end of Adventfjorden blew back out to sea. Still, we spent two hours zig zagging around the small pans, slabs and ice blocks that still somewhat attached to the shore. I tried to mimic the situations we would encounter on the sea ice near the pole - pulling up ice ledges, spanning gaps with skis, winding through drifts, high stepping over rubble... It was good practice, and if we ever get to the ice, we'll be even more ready than we were the day before. And the day before that... and the day before - you get the idea. 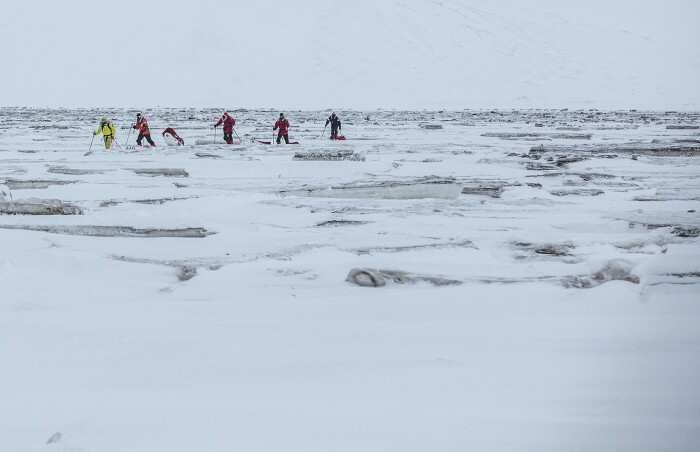 Image: Dean managed to sneak in this shot of me and most of the team during another short training trip to pass the time and hone our sea ice skills.